Children can create a 19th century Easter card during a spring celebration at Mac-A-Cheek Castle. WEST LIBERTY – Celebrate springtime at Mac-A-Cheek Castle on April 14 in an inter-generational program that starts at 3:30 p.m. and lasts for 90 minutes. Participants will engage in hands-on games and activities from The American Girls and Boys Handy Books published in the 1880s. The fun begins with the hiding of Easter eggs on the grounds surrounding Mac-A-Cheek Castle at 10051 Township Road 47, which is off state Route 287, one mile east of West Liberty. Inside the historic house museum, children can make an Easter card pictured in the 19th century Handy Books and color another from the Piatt family collection. 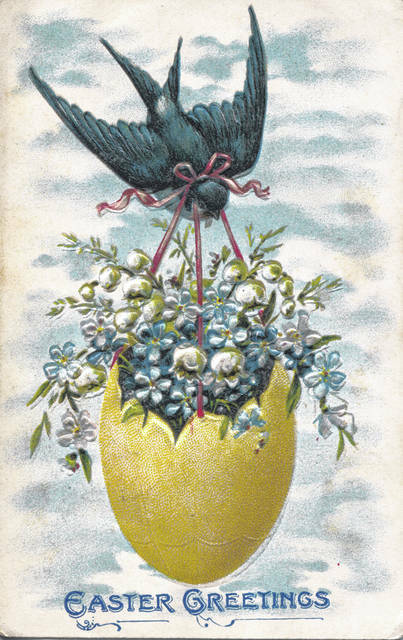 An exhibit of 19th and 20th century Easter cards will be on view. In the drawing room, families can share their own spring holiday customs and learn about how springtime stories have played in the Piatt family celebrations. Indoors and outdoors, children can play historical egg games from other countries including the German basket toss and an Irish game with rhyme. Outside, all can enjoy an Easter egg roll like the one first played at the White House lawn when Ohioan Rutherford B. Hayes was president. The event concludes with an Easter egg hunt, with teams searching for eggs hidden by others. No one leaves without an egg of treats. This program is sponsored by the Mac-A-Cheek Foundation for the Humanities with partial support from the Mary Eleanor Morris Fund of the Columbus Foundation. The admission fee supports interactive educational programs at Piatt Castles. In case of an extreme rain storm, outdoor games will be adapted for inside play. In addition to the fun of celebrating Easter, visitors can visit the castle a week before it opens to the public. Regular tours of both Piatt Castles begin on Saturday, April 20. The castles are open on weekends only from 11 a.m. to 4 p.m. through May 20. Starting Memorial Day weekend, the castles will be open from 11 a.m. to 5 p.m. seven days a week through Labor Day. The weekend schedule returns after Labor Day weekend and continues through Oct. 28. Tickets are available at the Spring Celebration and reservations can be made in advance through pay pal at piattcastles.org or by calling 937-844-3902.